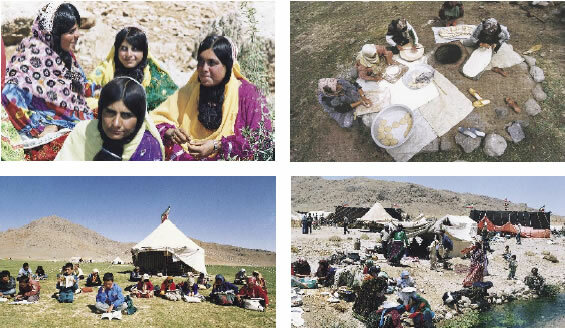 The nomadic tribal mode of life is probably the oldest way of social or group living which has survived throughout human existence and can still be found today in some parts of the world, such as Iran and as far away from Iran as Finland. Generally speaking this way of life depends on breeding livestock - mainly sheep and goats in Iran - with regular annual movements from cold areas to warmer areas in winter (Qeshlaq) and from warm areas to cooler areas in summer (Yeylaq). The characteristics of the way of life of nomads or "migrating" people in Iran are: annual migrations from Yeylaq to Qeshlaq and vice versa; a social structure which is of tribal form with the family as the strong and essential unit and the focus of this form of social life; the hierarchical form of the tribe; and the primary dependence of the tribe on animal husbandry as its major source of economic subsistence. By this definition all the gypsies of Iran as well as a large number of non-migrating tribes are excluded from the list of migrating people. In Iran, migrating tribes are scattered in a part of the country that covers some 960,000 or so square kilometers equal to 59% of the entire land. Parts of the country render themselves to Yeylaq and parts to Qeshlaq migrations. About 12% of these tribes live predominantly in Fars Province, 9.6% in Kerman, 9.2% in Khuzestan and 8.6% in Western Azarbaijan. According to National Statistics the people forming the nomadic tribes number 1,304,089 as 19,993 families, 592 sub-tribes and 101 tribes. At one time a considerable part of the Iranian population was formed of tribes, some 38% as late as 1867. Since then it has rapidly declined to as low as 9.6% in 1967 and a mere 1.8% in 1998. In the same year (1998) migrating tribes were made up of 51.7% males and 48.3% females, i.e. for every 100 females there were 107 males. The economic conditions of these tribes seems to have improved during the same period as the number of animals owned by them rose from 17.4 millions in 1987 to 22.7 millions in 1998. In 1987 about 27% of tribal members were literate which rate rose to 40.79% in 1998. Until not so long ago nomadic tribes lived in temporary huts or mobile tents of various types, using the kinds of materials and structures that had been used for thousands of years. Gradually permanent housing units with bricks and mortar were made at Yeylaq and Qeshlaq regions and this trend seems to continue steadily. At the same time more and more members of tribes are turning to farming as the major economic source of the family income; and have gradually settled down. Some families cultivate land during temporary stays in Yeylaq or in some cases even in Qeshlaq for an additional source of income to add to their animal husbandry revenues. Nowadays, however, more and more animals are fed with prepared fodder instead of or in addition to natural grazing, depending on the physical strength of the animals, and the general climatic and agricultural conditions. The current trend and the trend followed during the last century indicate that the migrating mode of life is about extinction. But, since variety adds depth and richness to a society, Iranian authorities are trying very hard to preserve this mode of life in Iran.